Cards: ProSet WLAF 1991, ProSet WLAF 1991 World Bowl, Ultimate WLAF 1992. Marlon Brown is a member of the deep 1989 NFL class. He was a 12th round pick of the Cleveland Browns after setting the Memphis school record with 19 sacks. His career highlights include a 4 sack performance against Louisville, which garnered him Associated Press Defensive Player of the Week Honors in 1987. 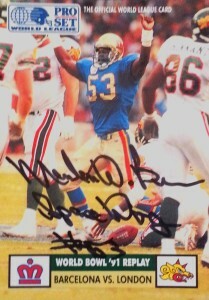 Brown joined the British Columbia Lions of the CFL in 1990 as a defensive end, recording 3 sacks and 7 tackles. 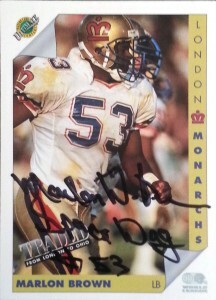 With the unveiling of the WLAF in 1991, the London Monarchs selected Brown with the 4th overall pick among linebackers in the inaugural positional draft. 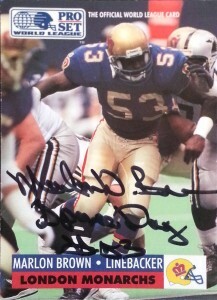 A key component to the Monarchs’ WLAF title run in 1991 and top rated defense, Marlon Brown finished on the All-World League Second Team. Spacedog had 42 tackles and 7.5 sacks. His 5.5 sacks in a 22-7 win over North American rival New York-New Jersey stand as a single game league record, and he was named player of the week. In World Bowl I, Marlon also contributed a sack in the Monarchs 21-0 shutout of the Dragons. Marlon was traded after the season concluded. His fortunes basically went from first to worst, as he’d join the Ohio Glory. He finished his career in the WLAF as a member of the New York-New Jersey Knights. From time to time I network with other collectors about the hobby. I’ve always admired Mark’s Signing Bonus. As a respected collector, I think he is a wonderful resource who cares about TTM and autographs as much as I do. I finally worked around to asking him about a few player successes he had, chief among them- Marlon. (I had emailed a lead before, but it turned out to be a case of mistaken identity.) Mark kindly helped me out and before I knew it, Spacedog had responded and included a nice note asking for a copy of his WLAF Ultimate 1992 card. Marlon barely has even noticed that almost 25 years have passed. He’s still in pretty good physical shape and runs his own trucking business out of Memphis that keeps him on the road a good portion of his time.